Poor Bridgeport, So Close To …? The people of Mexico have long had a saying that encapsulates their country’s history: “Poor Mexico, so far from God and so close to the United States.” I would borrow that approach when speaking of the history of Bridgeport, Pa. I have no idea as to any theological distance for either Mexico or Bridgeport, but just as Mexico’s history has been heavily influenced by its proximity to the United States, so has Bridgeport’s history been influenced by its proximity to Norristown. Such geographic closeness has not served Mexico well, nor has the local version been a good thing for Bridgeport. Bridgeport became a self-governing borough in 1851; by that date Norristown had been a borough for thirty-nine years, and the seat of Montgomery County for sixty-eight years. That gave it not only a head start, but also an insurmountable edge over its neighbor across the Schuylkill. Norristown spurned the Schuylkill Navigation request to build on its bank of the river, so the company built a canal section along the floodplain of what would become the borough of Bridgeport. The Schuylkill Navigation would contribute half of Bridgeport’s name, but little else. By considerable contrast, the Philadelphia, Germantown & Norristown Railroad’s arrival in 1835 would begin Norristown’s rapid ascent as a community. Bridgeport was not very far behind in establishing its own railroad connection, but the chronological comparison does not reflect the reality of the situation. The Reading Railroad built its line down the Schuylkill’s right bank, and opened service between Reading and Philadelphia—and thus Bridgeport—in 1839. Unfortunately for Bridgeport, however, the Reading’s sole focus was on moving coal, not people. The P.G. & N. to Norristown was a “general cargo” line, and that cargo included people from the very beginning. Even after the Reading leased the line in 1870 it largely continued the general cargo practice. On the Reading’s own line people were hardly even considered at first, and servicing them was initially sub-contracted. Transportation of people never assumed any degree of priority along this line; many Bridgeport residents desiring to travel found that a walk across the DeKalb Street bridge brought them a much more congenial treatment. The most serious problems from the nearby presence of Norristown fell on the fundamental institutions any growing community must establish. Those of both self-government and policing could be underwritten by even a slowly growing population, given the low expectations of the time. Bridgeport was thus able to establish and maintain the modest level of local government characteristic of the times. Those private institutions around which an actual community arises and shapes itself, however, proved more difficult to establish. The local volunteer fire companies are an excellent example. Bridgeport experienced in full perhaps the most common event to strike the Schuylkill River towns during their industrial heyday: fire. Pretty much lacking revenue from commerce and, unlike Norristown, obtaining none from the presence of government, Bridgeport lagged badly in establishing a volunteer fire department. The borough depended on Norristown fire companies for the first forty years of its existence, and beyond that, in truth. This arrangement pleased no one. Norristown companies rotated the responsibility for calls from Bridgeport, which caused no little ill will, and occasional claims of failure to respond. The borough’s first volunteer fire company came into formal existence in 1891. The volunteer spirit was there from the beginning, but several years passed before it obtained enough equipment to be an effective presence, thus requiring continued assistance from Norristown. The Goodwill Fire Company, the borough’s second, came into formal existence in 1915, and it too required some years to achieve usefulness. No newspaper ever established itself in Bridgeport and survived for more than a few years. Bridgeport’s only trolley line was a spur of the Norristown Passenger Railway Company until the Philadelphia and Western Railway built the high bridge across the Schuylkill. The P&W’s goal was Norristown; Bridgeport received only a stop on the line, which was later closed. Perhaps the heaviest, and easily the most obvious, of the many baneful effects Norristown’s presence inflicted on Bridgeport was that imposed on the borough’s commercial district. Norristown’s head start was never made up; its commercial sector had become the shopping location of choice for a wide swath of Montgomery County by the time Bridgeport came into existence, by which time the residents of the new borough had already been long-time customers of Main Street, Norristown, for anything more than the necessities of daily life. The major economic reason to establish a business in Bridgeport was the toll for crossing the DeKalb Street Bridge; it allowed the establishment of small businesses providing items a family needed on a daily basis. After the bridge was freed in 1884, even those were threatened. A business directory published jointly for Norristown and Bridgeport in 1912 (the year of Norristown’s centennial as a borough) demonstrates the commercial dominance that the larger borough exercised during the “golden years” of both communities. Every category listed stores in Norristown, but few listed any in Bridgeport. Among the facts it revealed was that while Norristown possessed thirteen stores selling “Dry and Fancy Goods,” Bridgeport possessed none. Norristown boasted twelve Furniture Stores, but there were none in Bridgeport. And the list goes on; category after category lists stores in Norristown, but none in Bridgeport. The only category that comes as no surprise is that of Lawyers; none had hung out their shingles in Bridgeport, but sixty-nine had done so in Norristown. It was the county seat, after all. Any numerical summation comparing the respective business centers of the two towns would also not reflect how many Bridgeport commercial firms were actually branches of the original Norristown store. Two prominent examples were Spillane's Five and Ten Cent Store and Daub Hardware. Both locations of both stores would close, as commercial collapse enveloped both boroughs. But that was then. This is now, and things have changed. Simply put, it is doubtful that Norristown still exerts sway of any sort over Bridgeport. It still possesses the superior transit connections it always has, although considerably diminished in both number and variety. Little else in Norristown would deter Bridgeport from establishing anything that could be supported by a population of the borough’s size. But what should those things be, in this time of stagnation for most of the towns along the Schuylkill River? Industry has pretty much gone, and it’s not coming back, at least in a size sufficient to employ more than a fraction of the borough’s residents. A commercial resurgence is even more unlikely, because for Bridgeport, the burden of nearness to a larger, more prosperous neighbor has merely shifted from north of the borough to south of it. Bridgeport is now “so close to King of Prussia,” that any plans for commercial resurgence should be given a very close reading. Let’s examine Bridgeport’s situation through a broad historical lens. In the early 21st century, Bridgeport is enduring, as are countless small, traditional urban areas, the complete reversal of the conditions that led to its birth, growth and prosperity in the 19th century. The residents of Bridgeport, as with those of each Schuylkill River town, found work, religion, information and entertainment, the whole package but for big-ticket items, within the boundaries of their respective communities. As a result, each town along the Schuylkill River has historically been inwardly-focused. The vast majority of residents not only worked within the borough, they walked to work, to church and to the store. Bridgeport’s residents were no doubt patrons of commercial entertainment across the river, as Norristown possessed several such venues, but as with every river town, Bridgeport’s entertainment centered on the community’s churches. Not only have those things changed, most of them have changed a full 180 degrees. At the dawn of the 21st century, what percentage of Bridgeport residents work in the borough? How many walk to work, to shop, or even to church? In this information age, do they even socialize in large groups at all? Most significantly, the looming presence of Norristown is no longer a factor, because Norristown no longer looms. Bridgeport is now, for the first time in its existence, free to pursue its future without significant reference to Norristown, and certainly no deference. Bridgeport has a past as a quiet, unassuming, modestly-sized and locally-oriented community, but that past is no longer a guide for the future. For Bridgeport, the fundamental physical facts remain: it's a small urban area on a hillside with decent, if not exactly adjacent, transportation connections. The housing stock is old, but there are several vacant lots and even areas. The railroad remains a presence, but not a stimulus, and the western end of town will probably remain under the shadow of the SEPTA Route 100 trolley for some time. Little else about the past need shape Bridgeport's future. The borough's population, and pretty much that alone, holds Bridgeport's fate in its hands. They should take advantage of the opportunity. Why Did They Build The Schuylkill Expressway? In an earlier post, I suggested that there are usually more fundamental reasons why something is done than those which dominate the publicity about it at the time, particularly when that something involves spending a substantial amount of the public’s money. My example was the “Pottstown Expressway,” a concluding link in the network of limited-access highways that have combined to relocate the economic core of Southeastern Pennsylvania from Philadelphia to King of Prussia. The fundamental reason for spending all that money to build the road—as far as the general public was concerned—was to throw a lifeline to beleaguered Pottstown; hence the name. 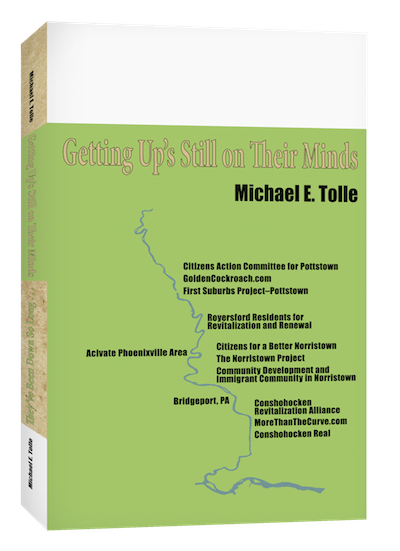 I had the temerity to suggest however, that the underlying and unspoken reason for the highway’s construction (not to mention its exact route) was to “develop” the stretch of land over which the new highway would be built, with any benefit to Pottstown appreciated, but by no means necessary. As I said then, there was nothing new about this. To demonstrate both the principle and to take it to a different—and more fundamental—level, I return to the days of the very first one of these limited-access highways and ask the same question: why did they build the Schuylkill Expressway? The idea of such a highway originated in the 1930s as a means for automobiles to drive into and out of Philadelphia more easily than was possible at the time. It was termed the “Valley Forge Parkway,” and was to connect Philadelphia (actually Fairmont Park) with Valley Forge Park. Its design was modeled on the parkways Robert Moses built to connect New York City with its immediate environs. Like the roads built by Moses, the Philadelphia Parkway was to be for automobiles only; no trucks allowed. It was an entrancing idea, but never anything more. The economic movers and shakers of Philadelphia viewed this eastward march of the Turnpike with great interest. They realized that the Pennsylvania Turnpike would finally realize the ancient goal of Pennsylvania’s leaders, one that dates back to William Penn: to connect the western and eastern ends of the Commonwealth so that commerce might flow between them, and in particular to the port of Philadelphia. The history of Pennsylvania is replete with attempts to accomplish this, all failures until the Reading Railroad, and even it was forced to follow a very circuitous route. A significant component of this long-abiding dream is rooted in the competition between Philadelphia and New York City that began in colonial times. The epic struggle between these two ports for economic supremacy on the eastern seaboard was quite a battle, fought out over a great many rounds spanning two centuries, but for Philadelphia, most of those were rear-guard actions; the winner had been decided quite early. One huge thing that continued to stick in Philadelphia’s collective craw after all these years was the memory of how Philadelphia had won all of the early rounds of this battle, only to lose the war. New York was a decidedly inferior city to Philadelphia, in virtually every manner of measurement, from early colonial times until after 1825. In that year the Erie Canal opened a connection between New York City and the fertile lands west of the Appalachians, and the riches of a rapidly developing hinterland quickly began to funnel increasingly through New York, not Philadelphia. Pennsylvania’s attempt to breach the Appalachians—the “Main Line of Public Works”—failed, and Philadelphia sank into an economic status permanently below that of New York. But even post-World War II Philadelphians possessed an intense, if resigned, view not just of their city’s history, but of its superior-turned-inferior relationship to New York City, the much bigger apple at the other end of New Jersey. That is why the approach of the Turnpike so interested them. Why, they reasoned, should we not make every effort to encourage that new traffic to terminate in Philadelphia, instead of New York City? There were two sound reasons for making this argument: the two roads travelers would encounter after they exited at King of Prussia. In 1950, arrivals at the new eastern terminus of the turnpike, whether commercial or private, would have had basically two choices once they left that modern marvel of concrete. They could use U.S. Route 202 to go north to New York City, or Pa. Route 23 to go east to Philadelphia. Neither was an appealing choice from a purely logistical standpoint, compared to the road that all confronted by this choice had just traversed. In 1950, U.S. Route 202 was a two-lane asphalt roadway for most of its length to New York, bristling (okay, relatively so, compared to today) with grade-level intersections and stop signs. The journey to Philadelphia via Pa. Route 23 was considerably shorter, but the road itself was worse, utterly inadequate for many cars of that era, let alone trucks. What if Philadelphia provided a modern, limited-access highway connection from the turnpike terminus into the heart of the city? And not a parkway, of course, but a limited-access highway open to commercial traffic as well? Would that not perhaps change the financial calculation of some manufacturing and shipping firms about the benefits of doing business in Philadelphia? Mind you, nobody actually believed that connecting to the Turnpike would reverse the economic fortunes of a century and a half, but neither did they want to send any potential traffic to New York by default if they could help it. This desire to send to Philadelphia, not New York City, the cross-state traffic that the city’s economic and political elite expected would arrive at the new eastern terminus of the Turnpike lies at the very foundation of the 1947 decision to build the Schuylkill Expressway. This lingering sense of economic competition was also the foundation on which support for such an expensive undertaking was built. To actually build such a highway its advocates needed to sell the concept to a much wider audience than the local lords of commerce, so they did. The good thing about the economic competition with New York City part was that like most foundations, it was largely out of sight. No one had to make the historical/commercial argument publicly, beyond mutually understood comments over lunch at the Rotary Club or dinner at the Chamber of Commerce (those are plural references, the economic benefit was widely understood). Everyone could concentrate on making the case of the Schuylkill Expressway as the greater good for the greater number, a much more popular approach. This wasn’t all crass hype; the steadily swelling residential suburbs on the periphery of Philadelphia were already an understood factor, as was frustration with the local roads. The latter was expected to reach a crisis point once the Turnpike extension opened. And so, the decision was made to build. Enough time has passed to obscure the local motivational components surrounding the construction of the Schuylkill Expressway, the deals and understandings that no doubt populated the decisions to locate what where, particularly those all-important on-off ramps. We are left with the broader and quite persistent issues of the Expressway's effect on Philadelphia and of its future in regional transportation planning. The Schuylkill Expressway did not quite contribute to the economic rebirth of Philadelphia after its completion in 1960, because no such rebirth took place. Highways encourage travel in both directions, regardless of the wishes of the planners who conceive them. The Schuylkill Expressway, designed to funnel vehicles and products into Philadelphia, proved to be a major artery by which wealth and capital flowed out of it instead. Whatever threat U.S. Route 202 may have posed to directing vehicles and products into Philadelphia has long since been rendered irrelevant by a multiplicity of limited-access highways that do not direct commercial and individual traffic into Philadelphia as much as allow such traffic to avoid the city altogether. So, on the subject of the Schuylkill Expressway, are we talking success, failure, or what? Our urban areas declined in value relative to their peripheries after the 1950s; that is beyond dispute. This process of disinvestment lasted for decades. The reasons for the collective debacle are many, and—most important of all—they interacted. We must never forget that, even as we try to isolate one of those many reasons by discussing the transfer of the resident urban population to the suburbs during this period, and who replaced them. Still, we are early enough in the process that such a focus is reasonably accurate. Things will get more complicated later. Last time, I offered some solid evidence that the first people to leave our towns and cities after the Second World War were the richest, those who, regardless of motive, could afford to. They had also started to leave long before the Federal Government intervened in the post-war era. These people were followed by the less well off, who could afford to leave once they had Federal mortgage financing and a Federally-subsidized college degree. I suggested (okay, that’s putting it politely) that we measure the movement out of our urban areas using a contributions/needs scale to compare the people who left to those who replaced them. But I only spoke of those who left; what about those who replaced them, the other half of the equation? Beginning with this question, I will try to tackle one of the most pervasive myths of our time; one that is widely held, but totally wrong. That’s why I term it The Big Lie. As long as it continues to be believed, little real progress in obtaining for our towns the goal of community can be achieved. "Things were okay around here until the colored started moving in." Ignore—for now—the obvious racism in the first and the implied racism and nativism in the second. Let’s focus instead on the point they both have in common, the myth I am talking about. Both believe that it was the arrival of poor (or just low quality; they tend to be the same in the eyes of many) people in a town that caused the rich people to leave. This is a lie, and it offers history exactly backwards: the departure of the rich allowed the poor to move in afterward. Poor people simply do not move into rich neighborhoods; they can’t afford to. Once a neighborhood has already begun to decline, poorer people can move in, and as the decline continues, so can the still poorer. Once we accept that people left our urban areas as they could afford to, let’s try to accept that people arrived for the same reason, and in the same progression. They couldn’t even start to move in until they could afford to, and they certainly couldn’t afford to while the upper class people were still there. We really must bury the old lie that the rich, “valued” (white?) people left a community because the poorer minorities were moving in; the poorer minorities were able to move in only because the rich had already left. To accept the hoary myth of the poor driving out the rich is to reverse cause and effect. This myth has achieved both a spread and a tenacity that is quite remarkable, given that it is obvious nonsense, as anyone with experience living in the real world could readily attest. The net exchange that began in the negative before the Second World War with the loss of the local “resident upper class” worsened as the steadily less well off could afford to leave (due to Federal Government incentives), and proceeded to do so in large numbers. The result was an urban community’s progressive decline along the contributions/needs scale. The exodus of the young and recently educated robbed a community of its actual (and potential) middle class, widened the decline of property values and greatly accelerated the downward spiral of our urban communities. Let’s be careful here, and not jump to conclusions about the complex point I am trying to make. I am chronologically still in the early phase of “suburbanization.” The net value loss to our urban areas that was well under way by the end of the Second World War would continue long enough for the motives of many of those who left to undergo a significant change. This change would in turn contribute to further urban decline along the contributions/needs scale; not initially, but all too quickly afterward. People began to leave not just because they could afford to (they could have done so earlier), but because they did not like the people who were moving in, even though these people could also afford to buy the home next door. Yes, we are talking about minorities here, primarily African Americans. Many people seem to have fixated on this, concluding erroneously that what was actually the middle phase of a decades-long process was its beginning. It wasn’t. The truly interesting—and easily the least understood—aspect about the initiation of this second phase of urban flight was that it did not necessarily signify any shift down the contributions/needs scale; those who moved in first were just as far up the scale as those they replaced. The new arrivals could afford to buy good houses in good neighborhoods just like white people, with no more government assistance than was available to white people, and probably less. But they weren’t white; that was the only significant difference. But it was enough. This is where we begin to identify something in the American character prompting a great migration that is rather different from rewarding veterans and restlessly seeking new vistas, as we have discussed so far. I can go so far as to use the words “the American character” due to the widespread nature of what happened, something close to an exchange of population within our urban areas, from great cities to small towns, most prominently in the industrial north and northeast, but by no means confined to those regions. Understanding why something happened requires comprehending what is cause and what is effect. That is tricky enough, as they are closely interrelated. But when you simply reverse the two, as in the belief that we are discussing, you perpetrate a myth, at the very least (it depends on your motives). But the very least is harmful enough, for lasting progress toward tomorrow cannot be built on a foundation of myths about yesterday. So, if you truly want to know what happened to our cities and towns, begin by rejecting The Big Lie. I believe in giving credit where credit is due. I write on a number of subjects, which, although related both geographically and thematically, might lead you to believe that I possess a vast, in-depth knowledge of many issues. You would be wrong. I recognize that even the small slice of reality about which I write is far too complex to understand completely. Perhaps more to the point, no one—myself included—has the time to become intimately familiar with such a wide variety of subjects. We depend on those who have done the spade work for us, the amateur local historians. Writing history is a collegial effort; anyone who attempts it alone will produce a defective product. All written history proceeds on what was written before it, whether the primary sources of the times themselves or the secondary sources prepared afterward. What counts is what each new work adds to the previous wisdom, changing it and making it reflect more closely what actually happened. It’s a repetitive process, with no final, conclusive viewpoint. Local historians tend to fall into three broadly defined categories: the very lucky but very few who actually are paid to write, those who pursue local history as a hobby then really get involved after they retire, and those who somehow find the time to research and write while they are pursuing careers and raising families. All three groups leave legacies, and each has a worthy example in the towns along the Schuylkill River. Local writing about the history of localities in Montgomery County is dominated by the work of Edward Hocker. The column in the Times Herald for which he would become famous, “Up and Down Montgomery County,” began appearing in 1922. He did, in fact, range up and down the county, although during his time Norristown was quite central to the county, so many of his columns focused on the borough. These establish him as the preeminent historian of Norristown. He tried diligently to write something about just about everywhere in the county, and purists fault him for overstressing local connections to major events, as not everywhere in the county had something of significance to remember. Regardless, Hocker’s columns are a marvelous source of early county history, and that of Norristown in particular. I have perused them many times for my work. Edward Hocker died in 1962, at the age of 89, but his columns were re-run in the Times Herald for decades. I’ve always though the parent company should publish a collection of his articles. I think they would sell well (hint, hint). Edward Hocker was a professional; i.e., he was paid to write what he did. Most local historians, however, are amateurs. This is NOT a judgment on the quality of their work, merely recognition that they don’t do it for money. They do it out of love for their communities, a love that actually costs them money, but they do it anyway. Pottstown has long had just such a dedicated chronicler. Michael Snyder somewhat straddles the line between professional and amateur, in the sense that he was a public school history teacher (now retired). That certainly counts as pursuing a career, yet he still found time to write over one hundred articles on Pottstown history for the Pottstown Mercury, and continues to write today. He published a book, Pottstown Remembered, in 2010, and currently serves as the president of the Pottstown Historical Society. I’ve emailed him about my current research, and look forward to meeting and talking with him on my next return to the area. I know he will teach me a lot about Pottstown history. The “twin boroughs,” Royersford and Spring City, are fortunate that William “Bill”Brunner chose to live where he did. Bill typifies the second group of local historians; he worked for a living and raised a family before retiring in 2001. He began as a collector of local post cards (he has published a book of them), and has become the local authority for this fascinating hobby. Bill joined the Board of Directors of the Spring Ford Area Historical Society in 1990, more than a decade before he actually retired. He became president of the Society in 2003 and remains so today. He still writes the quarterly society newsletter, and features a historical topic in each one. Bill has been—and continues to be—very supportive of my research efforts. He gave me personal attention upon my first visit to the Spring-Ford Area Historical Society, and we continue to correspond. I benefit greatly from his knowledge and from his passion for his community’s history. Royersford and Spring City play little part in the local discourse about our communities, and that is unfortunate. Their history is a component of the region’s history, their situation is faced by other communities of larger size, and their future will say much about how we respond to the challenges facing our towns. Downriver lies Conshohocken, a town that has always seemed to generate more than its share of proponents, people dedicated to spreading and preserving information about life in the borough. For a long time, William “Bill” Collins was at the center (although I don’t want to overlook his wife), remembering and writing about Conshohocken. Bill didn’t so much straddle the line between professional and amateur as render it irrelevant through his lifestyle. Bill Collins left us some time ago, but Conshohocken is fortunate in having someone who has labored long and hard—and continues to labor—at remembering and promoting his beloved borough. He personifies my third classification, those who have had to put earning a living and raising a family first, yet still found the time to generate an amazing amount of historical output. 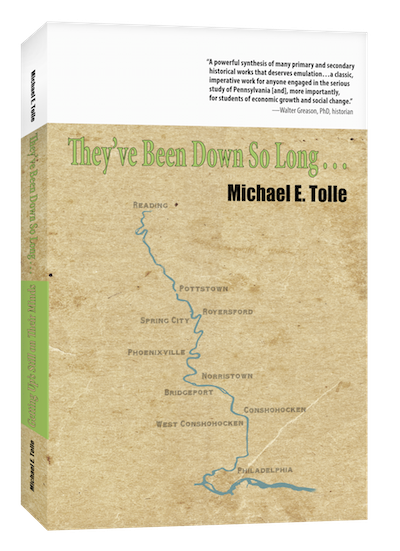 I can attest to this personally, having spent no small amount of time examining every document and publication concerning Conshohocken history to which I can gain access. My research has led me to this conclusion: if any of you, sometime in the last thirty years or so, have read something published about Conshohocken—its churches, its fire companies, or the many other subjects that make up its history—then you have probably read something written by Jack Coll. He is an extraordinarily prolific writer, has published photo books for Arcadia Press, and not just about Conshohocken. His vision extends much farther than that. He has accumulated a considerable photo archive, and provided me with images for my book What Killed Downtown? 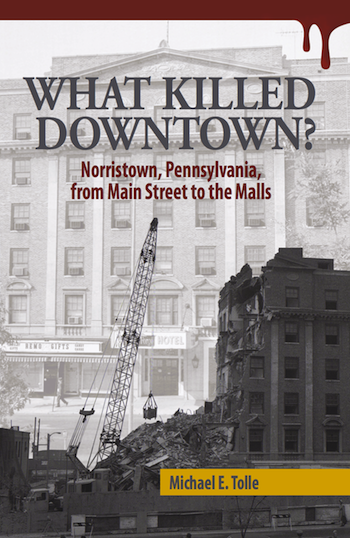 He also has personal experiences of downtown Norristown’s collapse that I utilized in the book itself. Remember, he has done all this in addition to raising a family and making a living, as one of the local merchants I like to celebrate (here’s a hint: it’s on Fayette Street, and has his last name in the title). You don’t have to go to the Conshohocken Library or Historical Society to read his work, although I always encourage such activities on general grounds; he publishes articles regularly on the website Conshystuff (http://conshystuff.com/). The website is the work of his son Brian, who is quickly developing a reputation on his own for boosting Conshohocken and its people. To my mind, the fundamental work of these quiet, often little-known recorders of local history cannot be overestimated. If I had to do all that work of accumulation, I would have little time left over to pontificate. So here’s to them!